How can I make a Interface which is similar to the Material-Interface within Blender via Python? It should look like these. Could you guide me to the right direction? I don't think it's in bpy.ops, right? The example given is called UIList. The following code is based on the Modifier UIList of this answer. 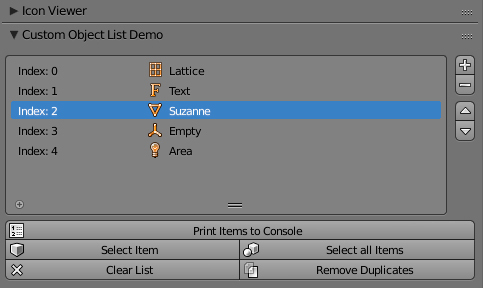 Once registered, scene objects can be added, removed, printed or selected via UI Elements. """Move items up and down, add and remove"""
bl_description = "Move items up and down, add and remove"
"""Print all items and their properties to the console"""
bl_label = "Print Items to Console"
bl_description = "Print all items and their properties to the console"
"""Clear all items of the list"""
bl_description = "Clear all items of the list"
bl_description = "Remove all duplicates"
"""find all duplicates by name"""
"""Select Items in the Viewport"""
bl_label = "Select Item(s) in Viewport"
bl_description = "Select Items in the Viewport"
info = "Nothing to select, object removed from scene"
"""Adds a custom panel to the TEXT_EDITOR"""
bl_label = "Custom Object List Demo"
As of 2.79 we can have real references to objects per ID by using a PointerProperty, which basically allows to display the actual data, access and edit the attributes on the fly. 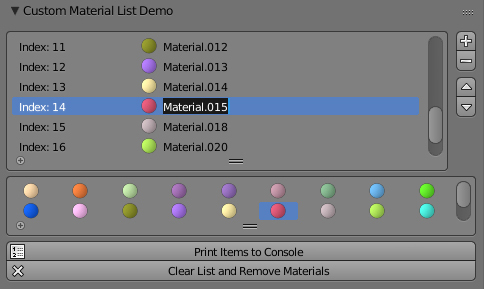 Following funky example is a simple demo on how to create a custom UIList of materials. You can create new materials, display and edit their properties (name, color etc.) directly within the list. """Clear all items of the list and remove from scene"""
bl_label = "Clear List and Remove Materials"
bl_description = "Clear all items of the list and remove from scene"
# "computed" for the given RNA object. bl_label = "Custom Material List Demo"
Same principle applies to all other types. Using the PointerProperty for e.g. 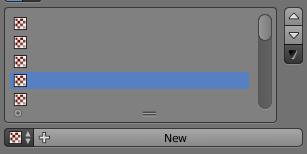 objects in the scene, makes it pretty comfortable to edit, add and remove them safely without any additional checks. Not the answer you're looking for? Browse other questions tagged python interface or ask your own question. How to create an operator to show and select multiple items? How to create a custom UI? How to create a simple list in the UI with Python API that would display data from Python? How do I load list content into a template_list? how do I build a list-multi-select widget using a box with operators? How to find the Python equivalent operation for tools, settings & menu? How to fill the surface of a mesh with cones which point to the normal, do not overlap, and have the minimum possible space between each other? How to find out which modes (object, edit, weight paint, pose etc) is activated using Blender's Python API? How to read a current value of the Cycles material node and write it to file?